If you’ve been paying attention over the past few years, you already know that mobile technology is drastically transforming fan engagement in the sports world. The innovations and mobile integrations that now come standard in TGSM’s mobile brand activation assets reveal just how quickly these new technologies have worked to transform current fan engagement strategies. And while the sports industry has led the way in adopting high-tech strategies for fan engagement, we’ve seen some recent projects that lead us to believe that the entertainment industry is not far behind. We recently teamed up with online retailer Zappos for an exciting new project that showcases just how creative we can be when it comes to customizing our standard activation assets. There is already an impressive set of high-tech features baked in to TGSM’s standard units. But as you’ll see – the sky is the limit when it comes to the creative customizations that are available. In the company’s short history, Zappos has established itself as one of America’s most creative and disruptive companies. When they opened their doors back in 2000 – they made some big waves in the retail footwear industry by offering free shipping and unlimited returns on online purchases. Their innovative strategy paid off, and Zappos’s sales grew exponentially for several years – until they were purchased by Amazon in 2009 for $1.2 billion. And although the Zappos brand has stabilized as a global leader in online retail, CEO Tony Hsieh continues to look for opportunities to innovate and disrupt traditional service industries to this day. 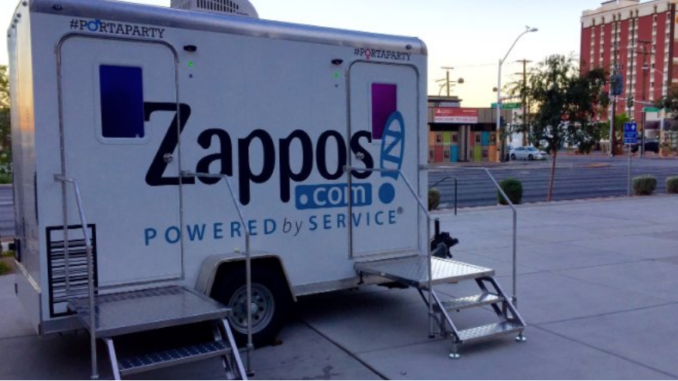 When Zappos reached out to TGSM, they were looking for a way to promote their brand and provide an unforgettable fan engagement experience for customers at concerts and music festivals. They thought that luxury porta-potties would be valued and appreciated by their customers, and they wanted to learn more about the options that were available to them. We’re happy to report that this project has been on overwhelming success. Between Zappos’s drive for creativity and innovation; and TGSM’s expertise in mobile brand activation assets – we came up with an unforgettable fan engagement strategy that has been celebrated by fans across the country. The project began simply enough. 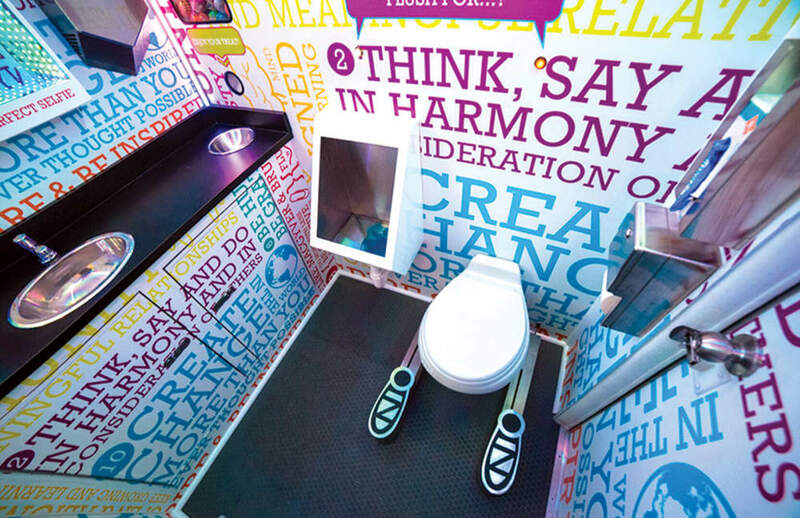 Zappos envisioned a luxury portable restroom for their customers, with red velvet ropes and a live DJ. But when they learned about the world of possibilities that TGSM brings to the table – the vision quickly expanded to include some imaginative and unconventional customizations. What could be any more boring than an automatic soap dispenser, right? That’s what Zappos thought too – and then they figured out a way to make this mundane mechanism funny and fresh. We positioned two soap dispensers side-by-side, and branded each one with a prominent political candidate. Visitors “vote” for the candidate of their choice by taking soap from that dispenser – and a running tally of votes is displayed in real-time on a 20-inch screen above the dispensers. Not everyone remembers to flush. At a busy concert, this can quickly create an unpleasant situation in a public restroom. To encourage everyone to flush at the finish, Zappos dreamed up a dispenser that drops a special prize onto the vanity countertop when the toilet is flushed. 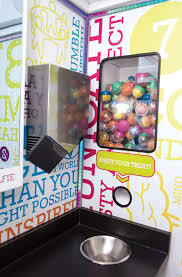 It’s something like a gumball dispenser – except the prizes it doles out include lip balm, temporary tattoos, whistles, glow sticks, chewing gum, and more. Sitting down on a public toilet is something that many people fear – especially at crowded events like concerts and festivals. Many ladies prefer to squat over the target rather than make contact with the seat in public restrooms. To make the experience as pleasant as possible, we worked with Zappos to design a custom set of foot-shaped platforms. Push a button on the wall, and the platforms mechanically move into position on either side of the toilet, creating the perfect place for a comfortable squat. Imagine stepping up to a urinal to do your business as you do every day, but as soon as your stream hits the back wall of the urinal you are instantly immersed in a wondrous combination of bright colorful lighting and mystical sound. That’s exactly what happens when you use the urinal in the Zappos Porta-Party. We integrated 24 sensors into the ring of the urinal – and visitors control the ambient lighting and sound by moving their stream around within the urinal. It’s an unforgettable effect, and a very personal approach to fan engagement. Whether you’re a lady who has just stepped off the signature squatty feet – or a man who created an audio-visual masterpiece at the urinal – everyone leaves the Porta-Party feeling engaged and entertained. We knew that many people would want to preserve the moment in pictures, so we built a perfect selfie station right into the wall of the restroom. With professional lighting and a custom branded background – everyone can capture the moment to share with their friends and family. By combining Zappos’s creative vision with TGSM’s expertise in mobile activation assets – we created a brand-new fan engagement experience that has never been done before. Fans across the country are raving about their experiences in the Zappos Porta-Party. And as a testament to their engagement, more than 77% of fans have stopped to snap a selfie on their way out. If you would like to learn more about providing luxury mobile restrooms or custom activation assets at concerts, festivals, and other entertainment events – contact TGSM today at (888) 995-2285. We’ll give you a virtual tour of our standard assets and help you navigate the endless options that are available for customization, branding, and digital integrations.